Zong is really an amazing telecom working in Pakistan to benefit its customers. Zong offers a bundle of packages for calling with strong signals and best quality services which presents free minutes after subscribing different call packages. And Zong Flutter Package is one of them that provide a lot more than the other bundles. It offers only Rs. 6 + tax for the whole day. It has a very economic rates which can cover the whole day. After its subscription the user can call at any time to anywhere within the boundaries of Pakistan. Each day of our life can fills with the joy and fun when we keep our connections up-to-date by calling them as and before. These relations like mother, sisters, daughters and best friends need our more attraction than the others. They can fill our life with joy and fun. So, to say thank to all such women Zong present this Zong Flutter. This Zong Flutter Package is especially made for such ladies to appreciate them in a more appropriate way. Simple send sms “Y” to 369 or dial *369# to subscribe to the Zong Flutter Package. From Zong to Zong, Rs. 1.80 will be charged for 1 minute at any time i.e. 24 hours a day. From Zong to other mobile networks, Rs. 1.80 will be charged for 1 minute at any time i.e. 24 hours a day. From Zong to PTCL, Rs. 1.80 will be charged for 1 minute at any time i.e. 24 hours a day. For mms from zong to zong and all other networks of Pakistan, Rs 3 per 300 KB will be charged. For SMS from Zong to Zong, Rs 1.30 per sms will be charged. For SMS from Zong to other networks, Rs 1.30 per sms will be charged. For mobile internet, Rs 4 per MB will be charged. For happy hour, just Rs. 5 + tax will be charged daily only for 1 hour i.e. the happy hour. From zong to zong friend and family numbers, just Rs. 0.35 + tax will be charged for 1 minute. Get 90 free minutes for calls from zong to zong anytime and anywhere in Pakistan every day. Get 100 free sms not only to zong numbers but to any number or any network of Pakistan at any time. On receiving calls from other networks, get free calls on any of the network daily. Enjoy flutter lounge every day. Every month, get special gifts worth up to Rs. 500,000 through lucky draws. Zong flutter package provides all the necessities of communication in a day which include rescue call, friends and family circle, happy hour, flutter bundle and many things more in the range. Dear customer! Keep on enjoying flutter and stay tuned for much more. If you want to go back to your previous package reply with N.
Now zong flutter subscribers can add friend and family numbers of their own choice and can enjoy unbelievable calling rates of just Rs. 0.35 + tax on per minute basis. For the activation, simply send sms ‘F <space> Number’ to 369 for the addition of desired friends and family numbers in your list. Conventional charges for the addition of friends and family numbers are applied. 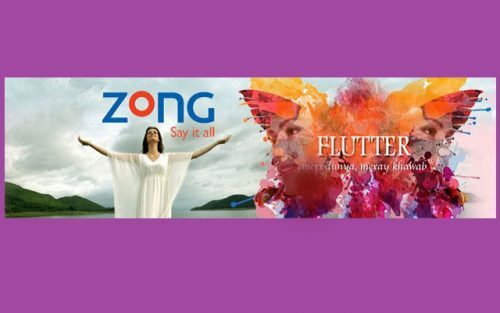 Now zong ladies do not need to depend on their father, brother or husband for a recharge of credit in their account as zong flutter rescue call is available in full of action. Zong flutter rescue call service provides its ladies customers with an immediate balance in need or difficulty when they are out of balance. This service brings a credit of Rs. 5 for sms or call which can be used and achieved at any time. If zong flutter subscriber wants to utilize the reserved amount then she just need to send sms Help” to 369 for the utilization of rescue call balance. Option number 0 is for 0000 HRS to 0100 HRS happy hour. Option number 1 is for 0100 HRS to 0200 HRS happy hour. Option number 2 is for 0200 HRS to 0300 HRS happy hour. Option number 3 is for 0300 HRS to 0400 HRS happy hour. Option number 4 is for 0400 HRS to 0500 HRS happy hour. Option number 5 is 0500 HRS to 0600 HRS for happy hour. Option number 6 is for 0600 HRS to 0700 HRS happy hour. Option number 7is for 0700 HRS to 0800 HRS happy hour. Option number 8 is for 0800 HRS to 0900 HRS happy hour. Option number 9 is for 0900 HRS to 1000 HRS happy hour. Option number 10is for 1000 HRS to 1100 HRS happy hour. Option number 11is for1100 HRS to 1200 HRS happy hour. Option number 12 is for 1200 HRS to 1300 HRS happy hour. Option number 13is for 1300 HRS to 1400 HRS happy hour. Option number 14 is for 1400 HRS to 1500 HRS happy hour. Option number 15 is for 1500 HRS to 1600 HRS happy hour. Option number 16 is for 1600 HRS to 1700 HRS happy hour. Option number 17 is for 1700 HRS to 1800 HRS happy hour. Option number 18 is for 1800 HRS to 1900 HRS happy hour. Option number 19 is for 1900 HRS to 2000 HRS happy hour. Option number 20is for 2000 HRS to 2100 HRS happy hour. Option number 21 is for 2100 HRS to 2200 HRS happy hour. Option number 22 is for 2200 HRS to 2300 HRS happy hour. Option number 23is for 2300 HRS to 0000 HRS happy hour.